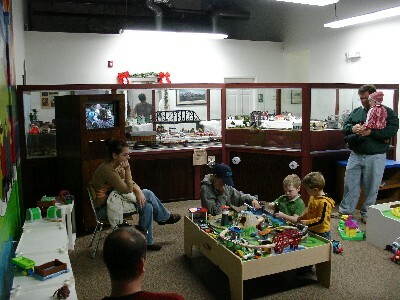 In the following series of pictures, you will see some of the many aspects of the Museum's model railroads. All told, we have 20 operating units in four scales throughout the Museum, demonstrating the craftsmanship of this fascinating hobby, and there are more than 70,000 hours of volunteer work invested in the displays. A video trip around our largest layout is shown in the following ten minute cab ride - www.youtube.com/watch?v=Je9wZavDnS4&feature=em-share_video_user. 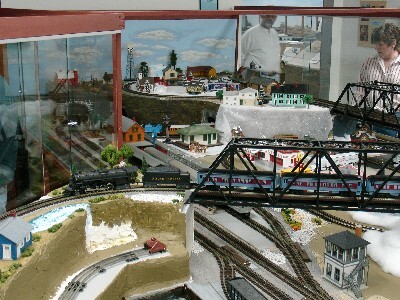 If these inspire you to investigate model railroading further we recommend a visit to the web site maintained by the National Model Railroad Association. Their introduction to model railroading information page can be found at www.nmra.org/beginner/. In the Children's Area You will find our Lionel/O-Scale layout with six operating units, including Thomas the Tank Engine. You'll also see lively action accessories, such as McDonalds, a gas station, coal loader, oil derrick, bridge, and playground swings. Blow the whistle for added realism! Craftsmanship and attention to detail make this layout a marvel. Based on images and history of railroading in the coastal areas of North Carolina, the model is set in the transition years between steam and diesel early in the 1950s. Double mainline tracks carry passenger and freight trains, sawmills and lumber yards are served by a branch line, trolleys are operating in the re-creations of Wilson and Wilmington, and shuttles haul loads to a powerhouse or switchyards. All told, more than a dozen units operate at the touch of buttons located around the layout. 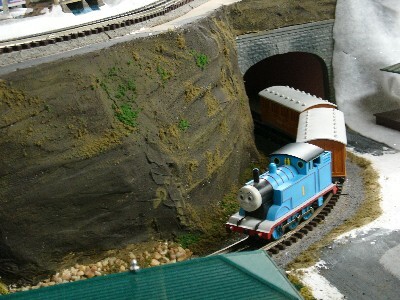 A view of the HO operating layout under construction in the Model Hall, June 2007. With 1500 sq. ft. of floor space, dedicated volunteer modelers create scenery and realistic structures. The finished HO operating layout in the Model Hall. Here are a few details about the layout, along with conversions to real-size equivalents, where applicable. Layout area: 750 sq. ft.
Volunteer time so far: over 70,000 hours total and counting. With countless details of buildings and scenery, the layout continues to be refined. There already are twelve operating trains, and many scenic features illustrate real-life prototypes.